The Belvedere Palaces form the heart of one of Vienna’s recommended sightseeing experiences. Here are my tips for what you should do there. OK, let’s get this one out of the way. You wouldn’t visit the Louvre and not see the Mona Lisa. So don’t visit Belvedere and not see Gustav Klimt’s The Kiss. It is a truly world-famous and iconic painting, hanging without fuss on one wall in the Vienna around 1900 exhibition area at Upper Belvedere. There may be one or two other people taking a look with you. A lot of Belvedere’s art makes a lasting impression. None, perhaps, more so than the busts by Franz Xaver Messerschmidt. Created in the 18th century, they would not look out of place in London’s Tate Modern or New York’s MoMA. Belvedere owns sixteen of the character head busts, a series of studies of weird and wonderful expressions, some of which you might expect in a Tim Burton movie. Most people focus on the two palaces and the gardens between them. But go around to the front of Upper Belvedere palace (the opposite side to the museum entrance). Then walk out beyond the small lake and look back. This is where to take probably the best photo of the palace and one of the best photos in Vienna. Ideally, wait until twilight to get the palace all lit up. And, if you can, go when the Belvedere Christmas market opens. Because the view across to the market and palace at dusk is truly magnificent. 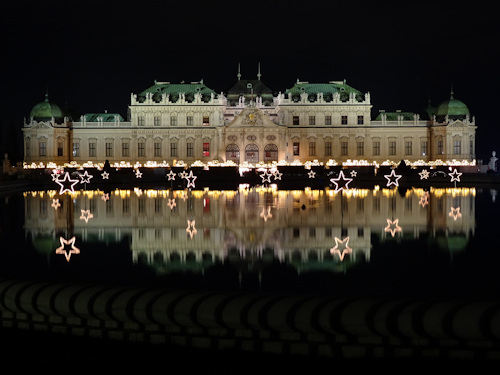 A ticket to the Lower Belvedere palace also allows you into the privy garden, a nice little baroque garden that provides some respite from the crowds. Walk to the very back and then look around you; not a sign of anything modern in sight. You are transported back into the time of Prince Eugene (albeit without the humongous wigs and poor sanitation). You can get a similar effect by looking out the windows of the Belvedere Orangerie, if you position yourself correctly in the windowed corridor. 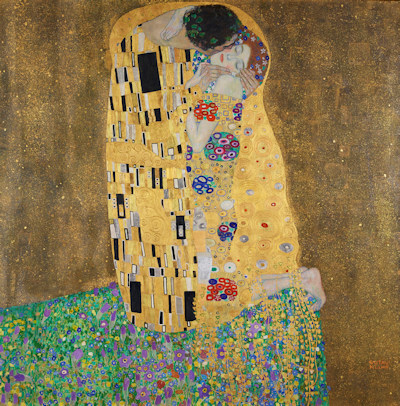 The Kiss is not the only iconic painting at Belvedere. 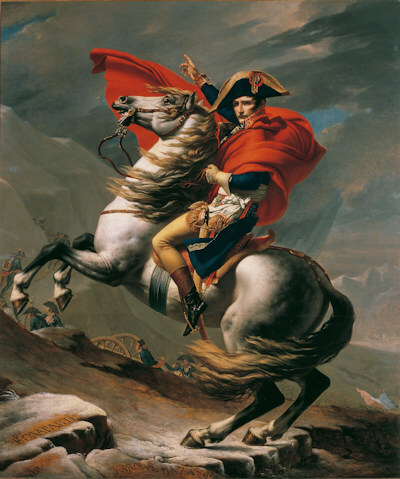 The famous image of Napoleon Bonaparte has the Emperor astride a rearing horse as he crosses the Alps, bicorne hat firmly in place, arm stretched out in authority. Jacques Louis David painted five such portraits, and one hangs in Upper Belvedere. The Kiss gets all the glory, but take time to view all the permanent exhibitions at the upper palace. The innocent little piece of art sitting in one corner might be a Van Gogh. Or a Schiele. Or a Rodin. To name but a few of the world-famous artists whose works you might see. Upper Belvedere boasts some impressive interior design, particularly the Marble Room on the first floor. Pop up to the second floor for views down into that same room, allowing you a different perspective on the illusionist paintings and marbled delights. Many of the rooms within both Belvedere palaces have been refurbished as modern museum galleries. Some rooms remain pretty much as they were (you’ll notice these from the innumerable frescoes, reliefs, statues, paintings and other such designs venerating the life of the not-so-modest Prince Eugene). However, even in the modern galleries, look up – the ceilings are often in their original state. When you’re done with Belvedere, walk down to the lower palace and return to the city centre on foot. This takes you past the huge Red Army monument and the giant Hochstrahlbrunnen fountain, which is otherwise slightly off the usual tourist walking routes. Do this at the end of the day in summer and the fountain lights up in different colours. And after all that, it’s time to reward yourself with coffee and cake.